Faith - Flowers - Food: Inspirations for celebrating Christmas. This beautifully designed coffee table book is all about the Christmas story, from the first prophecy about a coming Saviour, to the special love story of Jesus' conception and birth, and the many different ways we can be creative in celebrating it. It features floral designs with fresh and modern flower arrangements. From the simple that anyone can do, to the more advanced, elegant and stunning. Each creation can be done in the colour of your choice to match your Christmas theme. Also featured are many tried and true recipes for your Christmas dinner meal or parties, and things you might like to make and give away as gifts. Through this book, Heather reminds us to live, laugh and love, enjoy our creativity at this special time of year, to reach out to others, and remember the real reason for the season. View a sample of this beautiful book here. "I didn't buy For the Love of Christmas - I experienced it! 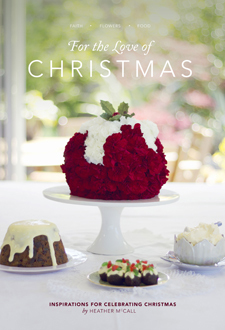 The book's stories, colour, and easy to make yet tantalising recipes revived my love for Christmas that had been lost. Thank you Heather for bringing back the true meaning of Christmas and its unique wonder." Heather was born in Gore, New Zealand, and spent her first 40 years in that area; including 21 years on her parents' family farm. After she married Murray, she spent another 20 years on their own farm bringing up their four daughters before moving north of Auckland. Being a farmer's wife taught Heather lots about cooking, baking and hospitality. Being a florist also added to her creativity.